The End of the Constitution of the Earth. A review of Samuel Zeitlin’s edition of Tyranny of Values & Other Texts (Telos 2018), by Carl Schmitt. By Gerardo Muñoz. 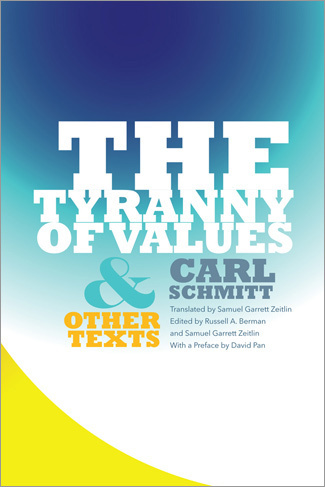 Samuel Zeitlin’s edition of Tyranny of Values and Other Texts (Telos Press, 2018) fills an important gap in the English publication of Carl Schmitt’s work, in particular, as it relates to his lesser known essays written during the interwar period. This edition is still meant as an introduction to Schmitt’s political thought and it does not pretend to exhaust all the topics that preoccupied the Catholic jurist, such as the geopolitical transformations of the European legal order, the rise of economicism at a planetary scale, or the ruminations over the early modern theories of sovereignty and its defenders. Indeed, these essays sheds light on the complexity of a thinker as he was coming to terms with the weakening of the ius publicum europeum as the framework of European legality and legitimacy, and of which Schmitt understood himself to be the last concrete representative, as he repeatedly claims in Ex captivate salus. As David Pan correctly observes in the Preface, the Schmitt that we encounter here is one that is confronting the transformations of political enmity in light of a gloomy and dangerous takeover of a global civil war. In fact, one could most definitely argue that the Schmitt thinking within the Cold War epochality is one that is painstakingly searching for a “Katechon”, that restraining force inherited from Christian theology in order to give form to the ruination of modern legal and political order. The global civil war, cloaked under a sense of acknowledged Humanism, now aimed at the destruction of the enemy social’s order and form of life. This thematizes the existential dilemma of a jurist who was consciousness of the dark shadow floating over the efficacy of Western jurisprudence. In other words, the post-war Schmitt is one marked by a profound hamletian condition in the face of the technical neutralization of every effective political theology. This condition puts Schmitt on the defensive, rather than on the offensive, as his later replies to Erik Peterson, Hans Blumenberg, or Jacob Taubes render visible. The essays in the collection can be divided in three different categories: those on particular political thinkers, some that reflect on political enmity and the concept of war, and two major pieces that deal directly with the crisis of nihilism in the wake of the Cold War (those two essays are “The Tyranny of Values” and “The Order of the World after the Second World War”). Zeitlin includes an early essay on Machiavelli (1927), a brief piece on Hobbes’ three hundred years anniversary (1951), a reflection on his own book Hamlet and Hecuba (1957), and a succinct note on J.J. Rousseau (1962). These are all not necessarily celebratory of each of these figures. Indeed, while in the piece on Hobbes Schmitt celebrates the author of Leviathan as a true political analyst of the English Civil War against Lockean contractualism; the piece on Machiavelli is a clear exposition of his loathe for the Florentine statesman. In fact, to the contemporary student of intellectual history these words might sound unjust: “[Machiavelli] was neither a great statesman nor a great theorist” (Schmitt 46). If politics is understood as the art of reserving an arcanum, as mystery of power against all forces of moral relativism and technical procedures, then, machiavellism’s endgame amounts to a mystified anti-machiavellinism that favors individual pathos over political decisionism. Machiavelli might have said “too much” about politics; and for Schmitt, this excess, points to the flawed human anthropology at the heart of his incapacity for thinking political unity (Schmitt 50). If juxtaposed with the essay on Hobbes, it becomes clear that Schmitt’s anxiety against Machiavelli is also the result of the impossibility of extracting a Christian philosophy of history, which only the Leviathan was able to guarantee in the wake of a post-confessional world. Whereas Hobbes provided a political theology based on auctoritas, non veritas, facit legem, Machiavellism stood for an impolitical structure devoid of a concrete political kernel. In such light, the essay on Rousseau is astonishingly curious. For one thing, Schmitt paints a portrait of Rousseau that does not adequately fits the contours of a political theologian of Jacobinism. On the reverse side of this, Schmitt also avoids making the case for The Social Contract as a precursor of totalitarianism. Rather, following Julien Freund, Schmitt polishes a Rousseau that stands for limited freedom and equality; a sort of intra-katechon within Liberalism, and in this sense a mirror image of every potential Hegelianism for the unfolding of world history (Schmitt 173). Finally, the piece “What Have I done?”, a response to a critic of his Hamlet and Hecuba, is aimed not so much at the making of a “political Shakespeare”, but rather at shaking up both the “monopoly of dialectical materialist history of art” as well as the “well-rehearsed division of labor” of the university” (Schmitt 139-41). This is critique has not lost any of its relevance in our present. Whereas the pieces on political thinkers is an exercise in reactroactive gazing on the tradition, the essays on political enmity and war are direct confrontations on the erosion of the European ius publicum europeum in the wake of the Cold War, dominated by the rise of international political entities (NATO, UN), and anticolonial movements of a new global order. It is in this context that Schmitt’s interest in the figure of the partisan begins to take shape as a way to come to terms with the new forms of mobility, irregularity, and changes in its territorial placement of the enemy. In “Dialogue on the Partisan”, Schmitt revises some of his major claims in Theory of the Partisan, while reminding that “the great error of the pacifists…was to claim that one need simply abolish warfare, then there would be peace” (Schmitt 182).The destitution of the ius publicum europeum, that oriented war making vis-a-vis the recognition of political enmity has, in fact, opened up for a de-contained partisanship in which the destiny of populations now was at the center. This new stage of political conflict intensifies the nihilism where potentially anyone is an enemy to be destroyed (Schmitt 194). As Schmitt claims in the short piece “On the TV-Democracy”, the question becomes who will hold political power and to what extent, as techno-economical machination becomes the force that directly expresses the Goethean myth of nemo eontra deum nisi dens ipse. With the only difference that the mythic in the essence of technology has no political force, but mere force of mobilization of abstract identities and what Heidegger called “standing reserve”. In this new epoch, the human ceases to have a place on earth, not merely because his political persona cannot be defined, but rather because he can no longer identify himself as human (Schmitt 205). Schmitt’s sibylline maxim from poet Theodor Daubler, “The enemy is our question as Gestalt”, thus loses its capacity for orientation. Already in the 1940s, Schmitt is contemplating a crisis that he does not entirely resolve. This is one way in which the important essay “The Forming of the French Spirit via the Legists”, from 1941, must be understood. This text on the one hand it is a remarkable sketch of French jurisprudence, grounded on “mesura”, “order”, “rationalism”, and sovereignty. It is no doubt an essay directed against royalist French intellectuals (Henri Massis and Charles Maurras are implicitly alluded to); but also at the concept of state sovereignty. Indeed, the most productive way to read this essay is next to The Leviathan in the State Theory of Thomas Hobbes (1938) written a couple of years prior. The impossibility of crafting a theory of the political in the wake of the exhaustion of the sovereign state form will eminently leave the doors wide open for a global civil war, as he argues in the post-war essay “Amnesty or the Force of Forgetting”. Schmitt’s defense of the a formation of the Reich in the 1940s will be translated in his general theory of a ‘new nomos of the earth’ immediately after the war. The two most important pieces included in The Tyranny of Values and Other Texts (2018) are “The Tyranny of Values” (1960), and “The Order of the World after the Second World War”. The “actuality” of Schmitt’s political thought has a felicitous grounds on these essays, although by no account should we claim that they adjust themselves to the intensification of nihilism in our current moment. There is much to be said about the weight that Schmitt puts on the “economic question”, a certain pull that comes from the emphasis of the much debated question then concerning “development-underdevelopment”, which does not really capture the metastasis of value in the global form of the general principle of equivalence today. Schmitt also deserves credit in having captured in “The Tyranny of Values”, the ascent of the supremacy of “value” in relation to the philosophies of life (Schmitt 12). Schmitt quotes Heidegger’s analysis, for whom “value and the valuable become the positivistic ersatz for the metaphysical” (Schmitt 29), which we can have only intensified in the twenty-first century. Perhaps with the only difference that “value” is no longer articulated explicitly. But who can deny that identitarian discourse is a mere transposition of the tyranny of values? Who can negate that the cost-benefit analysis, “silent revolution of our times” as one of the most important constitutionalists has called it, now stands as the hegemonic form of contemporary technical rationality? . At one point in the “Tyranny” essay, while commenting on Scheler’s philosophy, Schmitt says something that it has clearly not lost any of its legibility in our times: “Max Scheler, the great master of objective value theory has: the negation of a negation value is a positive value. That is mathematically clear, as a negative times a negative yields a positive. One can see from this that the binding of the thinking of value to its old value-free opposition is not so lightly to be dissolved. This sentence of Max Scheler’s allows evil to be requited with evil and in this way, to transform our earth into a hell, the hell however to be transform into a paradise of values” (Schmitt 38). It is a remarkable conclusion, and one in which the “mystery of evil” (the Pauline mysterium iniquitatis) becomes the primary function of the art of government in our times. It is here where we most clearly see the essence of the techno-political as the last reserve of legal liberalism. Schmitt would have been surprised (or perhaps not) to see that the disappearance of the rhetoric of values also coincides with a new regulation of disorder, whether it takes the name of “security”, “cost and benefits”, or “identity and diversification”. Indeed, now politics even has its own place in the consummation of the race for the “highest values”, since anything can be masked a “political” at the request of the latest demand. In his 1962 conference “The Order of the World after the Second World War”, delivered in Madrid by invitation of his friend Manuel Fraga, Schmitt still is convinced that he can see through the interregnum. Let me quote him one last time: “I used the word nomos as a character denomination for the concrete division and distribution of the earth. If you now ask me, in this sense of the term nomos, what is today, the nomos of the earth, I can answer clearly : it is the division of the earth industrially developed regions or less developed regions, joined with the immediate question of who accepts development from whom…This distribution is today the true constitution of the earth” (Schmitt 163). It is a sweeping claim, one that seeks to illuminate a specific opaque moment in history. But I am not convinced that we can say the same thing today. Here I am in agreement with Galli and Williams, who have noted that the disappearance of a Zentralgebiet no longer solicits the force of the Katechon . And it is the Katechon that guarantees an effective philosophy of history for the Christian eon. The Katechon provides for a juridical sense of order against a mere transposition of the theological. Indeed, it is never a matter of theological reduction, which is why Schmitt had to evoke Gentilis’ outcry: Silenti theologi, in munere alieno! I guess the question really amounts to the following: can a constitution of the earth, even if holding potestas spiritualis, regulate the triumph of anomia and the unlimited? Do the bureaucrat and the technician have the last world over the legitimacy of the world? Here the gaze of the jurist turns blank and emits no answer. One only wonders where Schmitt would have looked for new strengths in seeking the revival of a constitution of the earth; or if this entails, once and for all, the closure of the political as we know it. Carl Schmitt. The Tyranny of Values and Other Texts, Translated by Samuel Garrett Zeitlit. New York: Telos Publishing Press, 2018. Cass Sunstein. The Cost Benefit Revolution. Massachusetts: MIT Press 2018. See Carlo Galli, “Schmitt and the Global Era”, in Janus’s Gaze: Essays on Carl Schmitt. Durham: Duke University Press, 2015, p.129. Also, Gareth Williams, “Decontainment: The Collapse of the Katechon and the End of Hegemony”, in The Anomie of the Earth (Duke University Press 2015), p.159-173. Some Notes Regarding Hölderlin’s “Search for the Free Use of One’s Own”. By Gerardo Muñoz. In what follows, I want to comment on Martin Heidegger’s reading of Hölderlin’s well-known dictum from his 1801 letter to his friend Casimir Bohlendorff, “the free use of the proper is the most difficult thing”. Heidegger devotes a whole section to this enigmatic phrase in the recently translated 1941-42 Hölderlin’s Hymn “Remembrance” (2018) seminar, which dates to the years in which he was confronting Nietzsche’s work, and also more explicitly and for obvious reasons, the issue of German nationalism . In the wake of recent conversations about nationalism and patriotism in political rhetoric, it seems like a fitting time to return to Heidegger’s comments on Hölderlin’s work. This also marks a turn in Heidegger’s thinking of the poetic in the strong sense of the term, which has been analyzed widely in the literature. Heidegger begins by claiming that the “free use of one’s ownmost” requires a direct confrontation with “the foreign” but that at the same time, it is the easiest thing to miss (Heidegger 105). What is difficult is that which is already one’s own and nearest, and because it is intuitive, it is easy to overlook it. What is difficult is not due to some kind of epistemological overcapacity that today we would associate with the complexity of technical density, but rather, it is an immediate inhabitation, a mood of our belonging that is grasped beyond consciousness and propriety. Hence, it is easy to discard it in a gesture of dismissal due to its familiarity. It happened even to the Greeks. Heidegger quotes Hölderlin’s verses referencing the loss of the ‘fatherland’: “Of the fatherland and pitifully did / Greece, the most beautiful, perish” (Heidegger 105). Following an obscure Pindar fragment on the “shadow’s dream”, Heidegger shows that the absence is the most important element to illuminate the unreal as it transitions to the real. And this is what the poet does. Indeed, the poet can establish a “footbridge”, or rather it came bring it forth, to initiate a transition towards “what is historically one’s own” (Heidegger 109). If anything, what Greece and Germania point to in Hölderlin’s poetry is this otherwise of historical presencing, which Heidegger admits has nothing to do with historiographical accumulation or cultural metaphorcity (Heidegger 109). At times it is all too easy to dismiss what is at stake here. In the beginning of the twentieth century, for instance, E.M. Butler wrote a book titled The Tyranny of Greece over Germany (1935), which studied the “classical influence” of all things Greek since Winckelmann and German Idealism. Many do not cease to repeat the cliché that Heidegger’s thinking – even Schmitt in Glossarium laments the fascination with Hölderlin over Daubler, which is also the controversy between the critique of logos and a Christological conception of History – is a flight back to Greek ruminations for a new German beginning. Obviously, this is not Heidegger’s interest in reading the holderlinian use of one’s own. There is no cultural equivalence between the German and the Greek sense of belonging; rather it seems that what Heidegger is after is another way of thinking the historicity of the people, which is fundamentally a problem with the relation with time: “A humankind’s freedom in relation to itself consists in funding, appropriating, and being able to use of what is one’s own. It is in this that the historicality of a people resides” (Heidegger 111). The poet is the figure that, by asking the question about the most difficult thing (one’s use of the proper), can discover this task. Only he can take over the business of founding it (Heidegger 112). The task of the poet is always this “seeking”, which is already in Hölderlin’s first fragment in his novel Hyperion: “We are nothing: what we seek is everything” (Heidegger 113). The task of seeking opens itself to what is the highest and the most holy, which for Hölderlin is the “fatherland’. It is “holy” precisely because it is forbidden and the most difficult to retain. We are far away here from the sacrificial structure of Hölderlin’s “Der Tod Furs Vaterland” (“To Die for the Homeland”), which Helena Cortés Gabaudan has read in light of the archaic Horacian trope of ‘dulce et decorum est pro patria mori’; a staging of the heroic ethos against the backdrop of the aporetic conceit between thinking and action, the sword and the pen, the poet and the warrior in the early stages of the artist fallen into the age of revolutions . Something else is going on in “Remembrance” use of one’s own at the level of the very transformative nature of historical time, in so much as that which is most holy is nothing that resembles a past principle (a work of art stored in a museum, or the poem as an artistic medium), but rather an atheology, which is never negation or lack; it is always nearness to one’s own as the encounter with what’s “holy” (Heidegger 117). “What is more obvious than to interpret the turn to the fatherland along the lines of a turn to the “political”? However, what Hölderlin names the fatherland is not enchanted by the political, no matter how broadly one may conceive the latter…The turn to the fatherland is not the turn to the political either, however“. (Heidegger 120). Undoubtedly, this is a Parthian arrow directed at the political essence of the national understood as a gigantism of state, culture, and history as it was conjuring up in the European interwar period. It is also takes a distance from any given “standpoint” of the national becoming. In this sense, I am in agreement with poet Andrés Ajens’ suggestion that, against the dialectics of locational “alternative histories”, the problem of the national is that of an infinite task of the “desnacional” (this is Ajens’s own term) under erasure, in relation to the “foreign”, in preparation for the “passage of learning to appreciate one’s own” (Heidegger 120) . What we cannot grasp in the national is precisely what bears the trace of the task of ‘denationalization’ as the homecoming of “the clarity of presentation” in its discrete singularity (Heidegger 122). This last line is also from the letter to Bohlendorff. It is interesting that every time that the form of denationalization has been referred to in strictly political terms, it entails the overcoming of politics by an exogenous force that liquidates the capacities for its own limits. This is, indeed, the realm of the political in the strong sense of the term, in line with the emergence of sovereignty that Hölderlin’s poetic thought wants to curve toward an otherwise of the national. This use of the national wouldn’t let itself be incubated by the supremacy of the political. Let us call this an infrapolitical kernel of patriotism. This is why at the very end of this session Heidegger mentions that Hölderlin, unlike Nietzsche, must be understood as a “harbinger of the overcoming of all metaphysics” (Heidegger 122). We wonder whether the emphasis on the “People”, however fractured or originary, does not carry a residue of metaphysical rouse. Nevertheless, it is undoubtedly true that Hölderlin aims at something higher. Perhaps he aims at an “inebriation that is different from the “intoxication of enthusiasm” (Heidegger 125); that is, a distance from Kant who elevated the perception of the French Revolution as an anthropological affection. The step back of the singularity is driven by the “soul” – which Heidegger connects to the polysemic usage of the word Gemüt (at times translated as disposition or gathering) – as other than politics, since it sees through the offering of the dark light and keeps thinking in the human. Transposing it to our discussion, we can say that a politics is irreducible to Gemüt, and that only Gemüt is the excess in every politics. The use of one’s own, vis-a-vis the national (or the process of denationalization), is a resource to attune oneself with this “disposition”. No human can bear to be human without it. Hölderlin seeks to reserve this poverty as the primary task of the poet as a radical neutralization of all techno-political missteps. Or, in the last words in the session: “…it is the while of the equalization of destiny” (Heidegger 131). Martin Heidegger. Hölderlin’s Hymn “Remembrance”. Bloomington: Indiana University Press, 2018. Friedrich Hölderlin. Poesía esencial, ed. Helena Cortés Gabaudan. Madrid: Oficina de Arte y Ediciones, 2018. From a personal exchange with Andrés Ajens. Invitation to Two Working Groups: #TheEreignisTexts and #LacanianTheory. On Presentiment. The Anticipation of an Other Beginning. Ankhibasie. René Montero Montano on Invitation to Two Working Groups: #TheEreignisTexts and #LacanianTheory. johnw71 on Invitation to Two Working Groups: #TheEreignisTexts and #LacanianTheory. Vern on Hegemony, Legitimacy, and the Mature Position: on Chantal Mouffe’s For A Left Populism. By Gerardo Muñoz.